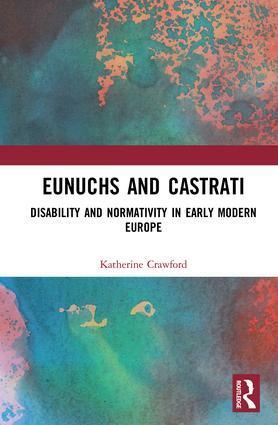 Eunuchs and Castrati examines the enduring fascination among historians, literary critics, musicologists, and other scholars around the figure of the castrate. Specifically, the book asks what influence such fascination had on the development and delineation of modern ideas around sexuality and physical impairment. Ranging from Greco-Roman times to the twenty-first century, Katherine Crawford brings together travel accounts, diplomatic records, and fictional sources, as well as existing scholarship, to demonstrate how early modern interlocutors reacted to and depicted castrates. She reveals how medicine and law operated to maintain the privileges of bodily integrity and created and extended prejudice against those without it. In consequence, castrates were constructed as gender deviant, disabled social subjects and demarcated as inferior. Early modern cultural loci then reinforced these perceptions, encouraging an othering of castrates in public contexts. These extensive, almost obsessive accounts of appearance, social propensities, and gender characteristics of castrated men reveal the historical lineages of sexual stigma and hostility towards gender non-normative and physically impaired persons. For Crawford, they are the roots of sexual and physical prejudices that remain embedded in the western experience today. Katherine Crawford is Cornelius Vanderbilt Chair of Women’s and Gender Studies at Vanderbilt University, USA. She is the author of three books, including The Sexual Culture of the French Renaissance (2010). She is interested in the ways that gender informs sexual practice, ideology, and identity in early modernity.